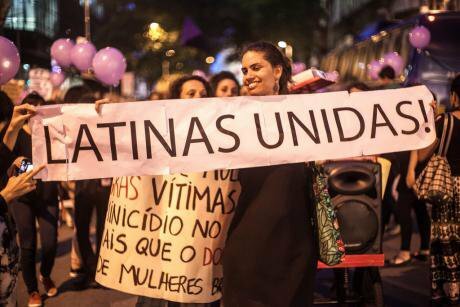 #NiUnaMenos demonstration in Rio de Janeiro. Some rights reserved. As we get on with the second decade of the 21st century, we find ourselves facing a growing gap between politics and society. Traditional leaders, political parties, and public institutions lack social legitimacy. Today, many presidents’ acceptance rates are lower than inflation. Citizens - especially young people – are less inclined to go to the polls and very few of them join political parties. Both in Latin America and in many other parts of the world, we are witnessing expressions of citizens’ discontent with politics. The spontaneous rallying calls on social networks, the spread of evidence of civil rights violations, and the popular demands channeled through instant messaging, assemblies, posters and politically-charged artistic expressions in public spaces bear witness to the use of digital and analogue tools as a reaction to discontent with political institutions, but also to the emergence of new structures, quite different from those of traditional political institutions. It is not just the insults. It is a philosophical question: the exclusion of the other, the denial of the other’s capacity to be part of the discussion. This being so, we propose a reflection on the nature of this hiatus and on the role of young people in the socio-political changes that are currently happening in Latin America. This is the reason why we ask ourselves, and analyze, what views young social and political leaders in the region have on democracy, what they are concerned about, what observations they make on politics and political parties, social mobilizations and the role of information technologies, for they are the ones who are defining new ways of exercising and thinking about politics. Between September and November 2015, we conducted an online survey of social and political leaders aged 18 to 40 in the Americas (26 countries), with focus groups in Honduras, Ecuador and Brazil (two groups in each country, one composed of social leaders and the other of members of the main political parties), a thorough analysis of major protests and in-depth interviews with experts from the region. Despite the consolidation of democracy in Latin America, the new millennium has witnessed a growing unease with political institutions. 43% of the young people surveyed in the Southern Cone, 60% in Central America, the Caribbean and the Andes, and 90% in North America say that their country is not very, or not at all democratic. They also point out, however, that in the last few years some institutional advances have been made, traditionally marginalized actors have been included, gender parity has progressed and so has, generally, the vitality of democracy. Therefore, the problem is not democracy as an idea of government. Rather, the perception of its deterioration is due to expectations - to the feeling that promises have been unfulfilled and insufficient progress has been made. Political parties are at the core of this crisis. They have become the political institution with less popular support. According to our survey, 80% of politically active young people have nothing to do with them and have little or no confidence in parties and elections. They argue that they do not feel represented by the current party system and that the main problem of parties is that they are "co-opted" and "out of touch with society." The young people surveyed feel, in addition, that politics has been dividing countries through polarization, lack of dialogue, discretionary exercise of power, and underestimation of society: "It is not just the insults. It is a philosophical question: the exclusion of the other, the denial of the other’s capacity to be part of the discussion. " This discomfort with the institutions can be clearly seen in the demonstrations emerging globally, where different political actors gather in movements and socio-political expressions, mostly led by young people, which combine the use of digital tools and analogical protests in the streets. The war in the Middle East and, later on, the financial crisis of 2008 in the North Atlantic prompted other uprisings – the Arab Spring, Occupy, the 2011 demonstrations in Russia, the 15M in Spain, revolts in Greece and Turkey. In Latin America, young people let themselves be heard in Mexico with #YoSoy132 and #YaMeCansé, in Argentina with #NiUnaMenos, in Honduras and Guatemala with the #Antorchas marches, in Ecuador with #Yasunidos, in Brazil with #VemPraRua, and in Chile with the Penguins - just to mention these. These revolts have, all of them, an urban, plural structure in which traditional actors (government, political parties, unions) have no leading role - in most cases, they are precisely the target. This new type of social protest gathers strength on specific issues, but these issues, however, act as a catalyst for a number of demands that have been piling up over time. Through these protests, civil society is seeking to strengthen a more direct, deliberative and collaborative participation, therefore promoting the emergence of community organizations and/or associations, social movements, and network groups. So, citizens with a high empowerment capacity are breaking loose from the monopoly of the parties, and this produces a deepening of democracy and results in the opening of the political system to historically excluded sectors of society. The crisis is then due to a disconnection between different forms of democracy. With practices, principles and organization opposed to those of political party based representative politics, what characterizes the emerging, mobilized political actors is their inclusion of non-traditional actors, their advocacy of open practices, their horizontal structures and their shared communication and action schemes. This disconnection is what puts current political regimes in check. Discomfort is expressed differently in each country. This new type of social protest gathers strength on specific issues: the 43 in Mexico, Nisman in Argentina, the Social Fund in Honduras, public education in Chile, the Inheritance Law in Ecuador, public transport in Brazil. The issues that trigger the protests, however, act as a catalyst for a number of demands that have been piling up over time. The new agents of change convene multifarious actors: they range from business and middle class sectors to students and activists traditionally active in both marches and participation spaces on social networks. The leaders are mostly young people, and the structures are mainly urban. In fact, it is hard to identify any organizational leadership. This is due to a variety of causes. On the one hand, structural demographic changes: young people between the ages of 15 and 29 represent around 26% of the total population in Latin America, but they are also one of its most vulnerable segments - 39% of them live in poverty and 22% make up the not in education, employment, or training sector. On the other hand, they are highly qualified to take advantage of digital technologies, they consume vast amounts of information, generate collaborative logics and produce new goods and services with high added value in knowledge. The impact of this generation born and raised in democracy, which hardly heeds the call of formal institutions and is a high user of digital technologies, generates a breeding ground for the emergence of a democratic culture which is quite different from that of traditional politics. The emerging political actors do not focus their activity on being members of an organization or a political party: they rather participate in many types of organizations and movements. For example, they tend to participate - at the same time - in environmental organizations, movements against gender violence and groups for the protection of street animals. Likewise, demonstrations bring together a variety of demands. Indigenous and environmental issues, and issues related to extractivism and corruption were present, for example, in the marches against the Inheritance Law in Ecuador. These issue-based political actions are also being translated into party politics. In Brazil, the "Activist Bench" is a multi-party proposal gathering LGBTI activists, hackers and environmentalists, among others, in the city of Sao Paulo. These movements have perspectives that go beyond national boundaries, for they are expressions of global solidarity agendas and networks. The Augusta Park occupiers in Sao Paulo were in contact through teleconference with those at Gezi Park in Istanbul, and organizations in many countries have shown their solidarity with Yasunidos and Ayotzinapa. They are concerned about global issues - environment, drug trafficking, social injustice, human trafficking – which require global solutions. Politically active young people work with organizations outside their country because they have regional concerns – so as to inform themselves, coordinate activities, and share experiences. Unlike political parties, which are homogeneous, circumscribed and secluded, these organizations are structured as ad hoc, open and informal networks. Links are weaker and networks more fragmented, but individuals meet their social, economic and emotional needs using low-intensity networks made up of acquaintances and contacts. They are created when and where groups no longer require centralized decision-making processes and top-down information flows in order to act in a coordinated way. And they include participation logics that are open, decentralized and founded on collaborative co-building. These practices, which can be clearly seen in the open calls, the dialogues in the social networks, the copy-left publications, the use of open source software, the collaboratively created hackathons, have been defining an ethics of collective action developed by the hacker community which has spread to large groups and social movements. It is scary to think about how we are going to live in a society if people cannot communicate without attacking each other. These expressions indicate a paradigm shift in political participation. Making use of available technology, society governs itself with rules and dynamics increasingly opposed to those of politics. Politics and society seem to exist in two different ecosystems. We are in the presence of a demos, the politically organized society, which has been undergoing changes in Latin America and the world, while politics has remained stagnant. What is more: the latter finds it difficult to interpret the ongoing changes. Despite their criticism, the young people surveyed identified political parties as the most relevant channels for producing public goods and for conveying social demands to the political system. The problem of political parties is not their role, but their running. Young people are asking for a different kind of politics, where the role of political parties be revitalized. So, how do we go about innovating them? Young people are raising the question, in the first place, of the need to re-establish political dialogue within countries: "It is scary to think about how we are going to live in a society if people cannot communicate without attacking each other." One of the key roles they are asking the political class to assume is the need to "articulate" – the word comes up again and again - the different social interests: "the challenge is to recover the diversity and inclusion that generate a plural political system" . Traditional politics requires a transforming, hacker culture too. Political parties are no longer the priority area for political action: society is participating now in other areas which are more plural, networked, flexible and related to close experience. This is why it is crucial that politics be “infected” with what happens in the streets, at the margins of the institutions, and that parties be "hacked" - that is, that they be permeated by the innovations taking place in society. Political actors with network logics, collaboration ethics and a vision of political innovation are promoting a qualitative change in the way society is organized and in the way citizens and the political system relate to each other. Another important point is that in large sectors, political and social, there is no longer any tolerance for corruption. And they demand a new civic culture and leadership in order to eradicate such practices - this is a central issue on the agenda. For example, the Anti-Corruption Party (PAC) in Honduras, and also Partido Novo in Brazil, were both created to this end, which comes to show the degree of social interest in the matter. Open government and fact-checking technologies are low-cost technology tools available to civil society which have a great impact on the quality of politics. Finally, there is much concern about the lack of a consistent agenda and, above all, about the lack of leadership to carry it out. Political and civic education and the need for new, "uncontaminated" leaders is crucial for this transformation: "In Ecuador, education and information are a pressing need, to strengthen political leadership, especially women’s leadership". The education that is called for is innovative education, bearing in mind the values, demands and practices of 21st century society, the capacity for social organization on the basis of open and transparent ethics, plurality of origin and p2p practices, aimed at training in the use of technology to democratize politics. We must rethink the emergence of new forms of political participation in democracy. Political actors with network logics, collaboration ethics and a vision of political innovation are promoting a qualitative change in the way society is organized and in the way citizens and the political system relate to each other. Some political parties are beginning to defend openly issue-based politics – like the Activist Bench in Sao Paulo -, to discuss the principle of representativeness - like the Network Party in Buenos Aires -, or hacker ethics in political action - like Wikipolítica in Jalisco . We must not, however, ignore the limits which can call into question the reach of these socio-political changes and can even deepen the crisis of the democratic system. These limits have to do with the gaps to access spaces and tools that foster political participation from the margins, but not only that: also its capacity for change and transformation. Democracies in Latin America show significant signs of fatigue. Political institutions in the region stand at a very low level of social legitimacy. In the first place, complex, pluralistic democracies that establish more participative channels require greater agency from an informed citizenry with access to digital tools. However, it is the urban youngest, richest, and most educated, who are using the most the available digital tools. Digital gaps increase therefore the already existing levels of inequality in society. Second, it appears that the protests and demonstrations mentioned are unconnected to the institutional decision-making processes and thus do not achieve concrete political results. That is, the 43 student teachers are still missing in Mexico and, despite #NiUnaMenos, the Gender Violence Act in Argentina has not yet been implemented. So, among the young respondents in our survey, expressions of caution arise: "people do not achieve much change without the political parties". On the other hand, how do you build power with networked actors without a gravitational core, without the territorial and institutional standing of the traditional political parties? After convening masses of people, spreading their agendas and making headline news, social protests tend to lose their strength and get diluted, because they are not able to establish leadership and connect with the spaces. Meanwhile, institutionalized power is still standing. Finally, we are facing weak institutions, permeable to concentrated interests and to co-optation by factual powers. The limits of socio-political change are also to be found in the specific weight that elites carry in shaping the public agenda and the decision-making process. Democracies in Latin America show significant signs of fatigue. Political institutions in the region stand at a very low level of social legitimacy. We are not, however, experiencing major setbacks or the emergence of an anti-political spirit, since many actors accept the democratic advances in the region, greater inclusion and greater institutional stability. The feeling of crisis, which is mainly political, focuses on the ways in which political power is exercised, in its concentration and in the discretion of the executive branch of government. Politics, and democracy, are dynamic processes, and structural changes are already under way. The crisis arises, precisely, because social actors are asking for new and better spaces of participation, open public ethics and more democratic forms of exercising power. These actors, their actions, characteristics and visions, are not antidemocratic but inclusive, cross-cutting and highly participatory. Non-traditional political actors are advocating ideas, practices and democratic participation logics which contradict the practices of democratic regimes. As opposed to the hierarchical, delegated and sporadic structure of institutional democratic practices, a network structure is emerging, together with an open, participatory and collaborative culture. But many challenges are emerging too along with these new political expressions, because the latter find limitations in generating stable agendas, coordinating initiatives and achieving concrete results. This is why the message is now the recovery of political parties, dialogue between social actors, and leadership founded on the values and practices which already exist in civil society. In short, politics needs to be reinvented to account for the social demands, political practices and technological possibilities of the 21st century. The disconnection between the demos and the cratos - or between society and the democratic political system - is not a recession in political participation, it is the emergence of a political paradigm shift. Politics, and democracy, are dynamic processes, and structural changes are already under way.